February 2007: As I charge this blog for another couple of months of entries, it appears that it has come full circle. It was in fact the celebrations for 2000 AD's thirtieth anniversary in 2007 that got me making a big celebratory post on my Livejournal - heavens, remember when that was important instead of just "another place where I announce that a blog post has gone live someplace else"...? - and then I started thinking about talking about the Galaxy's Greatest to a captive audience of about seventy or eighty regular readers from my 120-odd active "friend" list, plus whomever wandered through via Google, usually about three hundred a day. Times change. Last time I checked a little bug I keep, maybe a dozen users regularly look at that Livejournal page daily, and surfers number under a hundred. That's how soundly, and how firmly, Facebook killed that service. Thrillpowered Thursday was the first dedicated blog that I started writing, after a dual period of posting new material both at Livejournal and on Blogger. I had a couple of non-scrot real-world friends who didn't much enjoy the lengthy, image-heavy posts about 2000 AD and complained that they wished they could be filtered out from them, and a small, new, audience of regular readers whom I did not know and who had no real interest in my often oversharing Livejournal posts, and so I eventually made the much more sensible transition to writing here and linking there. Now I just have to hope that Livejournal's image hosting never goes away, because I really have no desire to upload all those older images onto Google's Picasa and re-code dozens of older entries. Really. I'm not sure where Sola had been working for the last twenty-odd years since he was last seen in the comic, but, if I may venture an intemperate opinion, his style certainly had not changed very much. Sola was very much of the old school who, for me, defined the look of IPC and DC Thomson titles in the early 1970s, and while he would occasionally blow the minds of kids with his work on, to name a fabulous example, Hookjaw in Action, his was never artwork that appealed to me at all. He had drawn many episodes of Flesh during its original five-month run in 1977, and occasionally turned in some episodes of MACH One before moving on from the comic. He never had a consistent run on a story or series, and his work really didn't have the solid, mass appeal to older fans that Massimo Belardinelli's or Dave Gibbons' or Brian Bolland's had. And, of course, with the bulk of his pages appearing in the dark days before creator credits in British comics - thank you, Kevin O'Neill! - readers didn't really know who he was anyway. With respect to Hookjaw's legion of fans, I just personally don't like his seventies work at all, and I remain baffled that something so very backward-looking and dated appeared in the comic for its birthday. Credit where it's due; Mills requested Sola specifically, because he wanted to do Flesh right and wanted an original artist for the job. Belardinelli, who drew the fantastic second book of the series, was retired and would soon leave us, and I don't think anybody knew who the heck the other artists from those first 19 weeks of Flesh were in the first place. They're credited by names like "Boix" and "Carrion," and all served, with Sola, in always making Flesh look like something to flip right past and get to some lovely Dave Gibbons art on Harlem Heroes. Then again, I'm perhaps in the minority who was never sold on Flesh in the first place. Maybe if I had come to it when I was six, the same way I found other dino - slash - giant monster fests like Land of the Lost, The Land That Time Forgot, Warlords of Atlantis and all those Toho movies, I'd have the nostalgic love, but instead it has always been the least entertaining, and, apart from when Belardinelli drew it in 1979, the worst-looking strip in 2000 AD. Belardinelli's story, written by Geoffrey Miller to no apparent objection by Mills, was just fantastic fun. Flesh was then rested until 1992-93, when Mills, then in his "not-fun-at-all" period of co-writing comics with Tony Skinner, assembled a lengthy and deeply silly story, "The Legend of Shamana," painted with mud by Carl Critchlow. There was a curious diversion in 1996. Under David Bishop's time as editor, there was a seven-episode Flesh story called "Chronocide." This positioned Earl Regan, the hero of the original story, as a time-traveling action hero in a more conventional drama co-written by Dan Abnett and Steve White. While it had dinosaurs and violence, the story lacked the over-the-top gore and carnage that typifies Flesh, and I have a memory, although I can't confirm it, that Mills was displeased that the strip was used without his input or involvement. Mills ensured that the series stayed dormant until he was prepared to revive it, in this curious "pilot" episode with its backward-looking artwork. It was not popular, and a new story would not emerge for another four years. Well, there's "backward-looking" and then there's "looking backward," which is what Robin Smith did with his little Tharg the Mighty strip, "A History of 2000 AD in Five Pages." 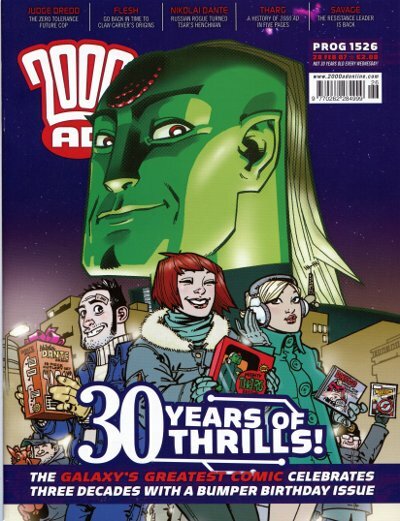 During Matt Smith's tenure as editor, the occasional comic adventures of Tharg and the creator droids, which had mostly been quietly shelved in the mid-90s, have been relegated to the occasional Droid Life strip on the inside front cover. I'm of the opinion that one of these would be more fun than almost any Future Shock and would make an agreeable change, but, then again, I have lots of silly opinions. This is the only Tharg comic strip of the last decade, a celebration-in-verse that, in five pages, takes the story of the comic about as far as the first appearances of Judge Fear and Slaine. In other words, it unwittingly implies that 2000 AD's Golden Age is long in the past. As nice as it is to see Robin Smith working in the weekly again, that's no way to celebrate your thirtieth birthday. No, as far as the actual celebrations go, there's that wonderful cover by Philip Bond, and the very good Judge Dredd multi-parter by Gordon Rennie and Ian Gibson, and the first episodes of new stories for Nikolai Dante by Robbie Morrison and Simon Fraser and Savage by Pat Mills and Charlie Adlard. In the following week's issue, this issue's one-offs would be replaced by new stories for Robo-Hunter by Alan Grant and Ian Gibson and Sinister Dexter by Dan Abnett and Simon Davis. That's a pretty good lineup for a happy birthday!